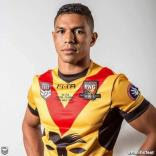 David Mead is a Papua New Guinean Rugby League player and in his short career has achieved enormous success both on and off the field. While he has had rewarding career in football in Australia, the 29 year old has never forgotten his origin and heritage to PNG. He is a passionate member of the PNG community, regularly returning home to represent his country and to promote rugby league at a grass roots level. David's fond memory's of PNG was living life in the village of Tubusereia where he regularly went to his grandparents subsistence farm to plant and gather vegetables between the age four and twelve years old. David is committed to being an ambassador for the country he loves. David's first National Rugby League game was in 2009 when he debuted in Round 13 for the Gold Coast Titans against the St George Illawarra Dragons. A love and passion for sport from a young age in Papua New Guinea often saw him play footy with mates in his village using plastic bottles instead of a ball. At age 12 he moved to Australia with the help of his aunty who wanted to give him a better educational opportunity. David spent weekends at school playing junior football and cricket at Lismore Marist Brothers. A natural athlete, he was signed by the Titans straight from school aged 17. During his eight years at the Titans he scored 67 tries and became well known for his lengthy and spectacular try scoring efforts. He was not only the top try scorer in 2011; he also became the first player to score 50 tries for the Club in 2013. David's representative career is also impressive, consisting of 13 games for Papua New Guinea scoring 10 tries. Most recently David captained the PNG Kumuls in the 2017 Rugby League World Cup. Leading the team to top their division pool which secured them a quarter final game against England in Melbourne. David lead the Kumuls to their first victory overseas in 14 years when they played Fiji in 2016. He made some outstanding try saving tackles which helped his team claim the victory. He has also played two representative games for Country Origin in which one of them he received Man of the Match. David also played in the Auckland Nines tournament in 2014, 2015 and 2016 for the Titans and the World All Stars team against the Indigenous All Stars in 2017, where he received Player's Player. In 2017 David joined the Brisbane Broncos. He played 12 games in first grade during the season, the highlight being the semi-final win against the Penrith Panthers in which he played one of the best games of his career. As his career continues, with 71 tries in the top grade under his belt, David has aspirations of achieving his childhood dreams of winning a Premiership. To date he has played 160 NRL games and is continuing his career in the Super League where is plays for the Catalan Dragons in France.